Last week I asked: Where can you see the artwork of Chihuly? Many places, including Portland, Oregon. The first time I saw the work of Dale Chihuly was at the Corning Museum of Glass where visitors are greeted by a vision of blown glass that resembles a fluorescent green-tentacled sea creature. 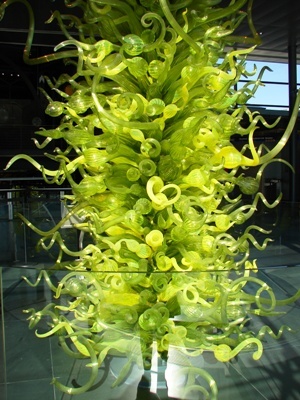 It is called the Fern Green Tower and is just one of several of Chihuly’s works at the museum. I was impressed with Chihuly’s creativity. 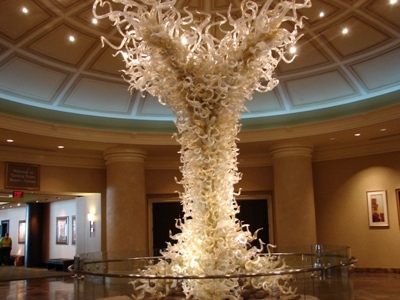 I was somewhat surprised when I saw another Chihuly at the Turning Stone Resort and Casino. It seemed like an unlikely place to see such a fragile looking piece of art. I felt like I was on a Chihuly Discovery Trail when I saw another one of his creations at the National Liberty Museum in Philadelphia. Chihuly’s work is fantastical and so easy to recognize I decided to do some research about the artist. Dale Chihuly was born in Tacoma, Washington, and studied glassmaking and taught glassmaking in many locations worldwide. His work is found in more than 200 museums worldwide. I was excited to learn that a new museum dedicated to his works opened in May in Seattle, Washington. And, Seattle was on our travel schedule. The Chihuly Garden and Glass, the world’s largest Chihuly exhibit, includes eight galleries, the Glass House, and the Garden. It is located at Seattle Center, which is also home to the Space Needle, the Pacific Science Center, and the Experience Music Project so it was very convenient to all the places we wanted to visit while in Seattle. I think of Chihuly as the Willy Wonka of glass – it magical and colorful. We started in the Glass Forest where molten glass was dropped from step ladders to create a forest of glass trees. It is an example of Chihuly’s teamwork concept in creating art. The Northwest Room with examples of his baskets explores the influence the Northwest area and the Native American culture had on his work. On display is his collection of Native American trade blankets and also his Native American photographs by Edward S. Curtis. Chihuly works from his sea life period are found in the Sealife Room where the massive piece includes starfish, octopus, and floats amid a mass of colored artistic glass works. To me, is seemed that people looked in silenced awe at his works in the Chandeliers Room. I was especially taken with the Float Boat on a “sea” of black glass that reflected the brilliant, whimsical cargo. 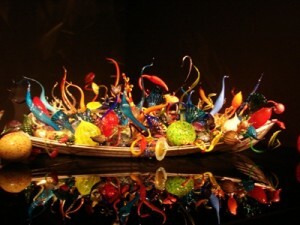 Chihuly actually used a boat to transport some of his work which is where the idea came from. Chihuly has always been intrigued by glass houses and now he has one with a 100-foot long suspended glass sculpture. Most impressive. Actually, our first view of Chihuly’s works in Seattle was from the viewing deck of the Needle as we looked down into the Garden. The Glass House exits to the Garden with four monumental sculptures amid the plantings that represent the seasons going from “hot” represented by the red, yellow, and orange “Pacific Sun” to cool. Now, whenever I visit a new location I will check to see if there is a place to see more of Chihuly’s works. Travel Trivia Tease™: Where was pizza invented? 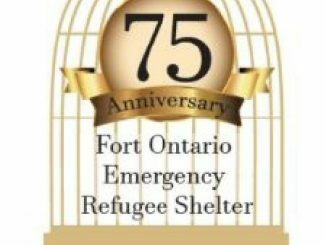 Look for the answer next week.